OEM Manufacturer of a wide range of products which include pentagon copper bonded earthing rod, chemical earthing electrode, earthing system, lightning solution and earthing electrode. We are manufacturer, supplier, trader, wholesaler, exporter & importer of Earthing System. All the products offered by us are in huge demand and are widely appreciated for their durability and efficiency. We also offer Earthing Services. 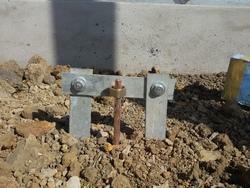 We are a reliable and most trusted name in this domain engaged in providing Earthing Solution. The provided Earthing Solution is well executed by our team of professionals by utilizing modern tools and equipment. We provide our services to our clients at market leading rates.